Summer is finally here, which means it’s finally time to replace that drone you crashed on Christmas Day. Here’s some advice. Don’t buy an expensive drone if you don’t know how to fly. Cheap drones have gotten really good, and there’s no better way to hone your skills without exploding money into the side of a tree. The problem with cheap drones has always been the cost to quality ratio. If you go too cheap, you risk losing an eye thanks to awful flying abilities. If you go too expensive, you might as well upgrade to a more full featured drone like the DJI Spark or the Yuneec Breeze. So for our latest installment of Battlemodo, we rounded up three cheap drones with three different approaches to cost versus quality: the $70 Drocon Cyclone, the $100 Ryze Tello (powered by DJI technology), and the $180 Parrot Mambo FPV. Our battles were straight forward. How easy is it to get airborne? How well does it fly? How good is the camera? Spoiler: the winner won by a landslide. Unlike their larger, prosumer siblings, cheap drones are relatively simple affairs. There’s a battery, four rotors that stay on the drone, and typically, four clip-on attachments to form a hull for safety. Even still, getting the little birds in the air can be annoying if the controller or app doesn’t work well. That’s why we focused on the frustration of flight preparation for this first battle. The Drocon Cyclone was immediately eliminated—not just because of how shady the set up is, but because of how dangerous it is too. Let’s get the painful one out of the way first. The Dronon Cyclone, Amazon’s best-selling cheap drone, is a nightmare. To fire up the gadget, you need to plug a shady-looking battery into a tiny cable in the drone’s undercarriage, and then, when you switch on the flimsy controller, the drone is immediately live. It’s frightfully easy to hit the throttle joystick before you’re ready. Meanwhile, you don’t need to use the app to fly, and you really shouldn’t use it at all because it’s so terrible. We eliminated the Drocon drone from this battle immediately. The Ryze Tello and the Parrot Mambo were both pretty easy to get flight ready. Both use handy battery packs that clip into the drone. Both work well with separate controllers, though it’s worth pointing out that the Mambo comes with a controller while you have to buy one separately for the Tello. The Tello is also different because it comes with a built in camera, while the Mambo uses one that clips on to the top of the body. All that said, the Tello defeats the the Mambo in this battle simply because the software is slicker and more dependable, perhaps thanks to the underlying DJI technology. It’s just easier and quicker to get the Tello in the air. All three of these cheap drones fly—some much better than others! 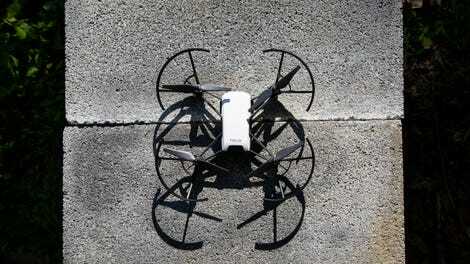 But what makes any drone worthy is the ability to fly steadily and maneuver effectively. Otherwise, you’re stuck with an expensive kite drifting around on a windy day. That or you just crash. So for our airworthiness battle, we sent all three drones through an obstacle course involving trees and more trees. This time around the Drocon isn’t just a nightmare. It’s a dangerous nightmare. This is largely because the Drocon doesn’t fly like most quadcopters. Instead of moving the drone up or down in the air, the left joystick simply works like a throttle. To increase altitude, you push up, but to decrease altitude, you just let go of the joystick and the drone enters a free fall. The effect is kind of like trying to levitate a ping pong ball by blowing through a straw. The only upside is that the Drocon is so light and crappy that it doesn’t shatter into a million pieces whenever it inevitably comes crashing back down to Earth. The Ryze Tello is just damn good. Once again, the Tello and the Mambo appear to be pretty equal contenders in this battle. What differentiated one from the other, however, was stability. The Tello feels rock solid in the air compared to the Mambo which tends to drift. That drifting resulted in several close calls on the obstacle course and one sort of inexplicable crash. The Tello isn’t as stable as a more sophisticated drone equipped with GPS to hold the quadcopter in place, but it was almost twice as easy to fly as the Mambo, which is nearly twice the price. Cheap drones aren’t known for their photography abilities. In fact, the cameras on all three of these quadcopters is primarily useful to see where the drone is going. All three drones are supposed to have 1080p HD cameras, but the difference in quality is incredibly stark. No surprise here, but the Drocon’s camera was the worst. The grainy picture looked like something seen through the lens of a cell phone camera circa 2003. It’s laughable, actually. The Ryze Tello took terrific pictures of this bucolic scene. The Parrot Mambo FPV took foggy and blurry images of this bucolic scene. The Drocon Cyclone took… a picture? The Mambo is much better, but it isn’t great. In our testing, the lens actually ended up acquiring a bunch of dust that led to oddly foggy images. After we cleaned off the lens and tested again, though, the images were sharper, but the fogginess wasn’t entirely gone. Again, you’d be able to see where you were going if you wanted to use the drone in FPV mode (that’s where you wear a headset and use the drone’s camera as your eyes). You wouldn’t want to take photos with the Mambo, though. The Parrot Mambo FPV’s camera could get foggy in flight, which makes for bad photos and videos. So no surprises again. The Tello bested the other two drones in camera quality. While recorded video comes out shaky due to wind—this was true for all three cameras—the still image quality from the Tello’s camera was impressive to say the least. We took a photo of midtown Manhattan, and the you can make out the tiniest details, just as you’d expect from any camera that captures HD images. The Ryze Tello simply smokes its competitors. And at $100, the little DJI-powered drone is a no-brainer of a deal. If you spend a few extra bucks on a Bluetooth controller, you can easily learn to fly on the Tello, and thanks to the surprisingly good camera, you can learn to become an aerial photographer, too. Inevitably, however, cheap drones are fancy toys that will serve as a gateway to fancier toys: quadcopters like the DJI Mavic Air or even the Phantom 4. And before you spend $1,000 or more on one of these for aerial photography, you should definitely spend some time with a cheap drone. They survive crashes better. They’re smaller and safer. And for some, they’re more fun. The Ryze Tello is definitely all of these things.